Links Estate Agents are delighted to offer to the market this wonderful family home. Situated within one of Exmouth`s most sought after residential areas is this impressive, 4 bedroom and 2 bathroom, 1920`s detached house, with a modern fitted kitchen / dining room to the rear, a Southerly facing rear garden, garage and brick paved driveway. This uPVC double glazed and gas centrally heated property comprises, on the ground floor, an impressive entrance hall with cloaks cupboard, cloakroom with utility cupboard bay fronted sitting room, large kitchen / dining room with sliding, panoramic doors to the rear garden and study / bedroom 5. Apart from the sitting room, all the rooms have tiled floors with under floor heating. On the first floor are the 4 bedrooms, master en - suite shower room and family bathroom. Subject to gaining the usual planning consents, the loft could be converted to provide further living accommodation, if required. From the front bedrooms, Exe Estuary and Haldon Hill views are enjoyed. Within the Southerly facing rear garden is a composite decking area, with a sunken hot tub, immediately adjacent to the property, with the remainder laid to lawn. The property further benefits from a single garage with remote controlled roll up and over door and brick paved driveway that provides off road parking for up to 3 motor vehicles. This is a truly wonderful home in a fantastic location and an early appointment to view is strongly advised to avoid disappointment. Velux window to side. Modern white suite comprising low level WC and vanity wash hand basin. Tiled flooring with under floor heating. utility cupboard having space and plumbing for washing machine and space for tumble dryer. Inset ceiling lights. Walk - in bay window to front. 2 Radiators. TV point. Picture rail. Velux window to side. External door leading to rear garden with matching picture window to side. Tiled flooring with under floor heating. Inset ceiling lights. Obscure glazed window to side. white suite comprising shower cubicle with thermostatically controlled shower unit and tiled splash backs. Low level WC. Vanity wash hand basin. Heated towel rail. Extractor fan. Shaver socket. 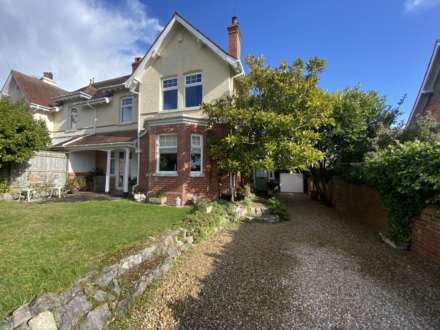 Walk - in bay window to front with Exe Estuary and Haldon Hill views. Radiator. Laminate flooring. Picture rail. Window to rear gaining views over Exmouth. Radiator. Picture rail. Dual aspect having windows to side and front gaining Exe Estuary and Haldon Hill views. Radiator. Picture rail. 2 Obscure glazed window to side. White suite comprising panelled bath with thermostatically controlled shower unit over. Concealed WC. Vanity wash hand basin. Fully tiled walls and floor. Heated towel rail. Inset ceiling lights. To the front of the property is a brick paved driveway for up to 3 motor vehicles. Brick wall boundaries and hedge screen. Remote controlled roll up and over door to front. Velux window to side. Power and light connected. The property enjoys a good sized and Southerly facing Rear Garden. Immediately adjacent the property is a composite decking area, with sunken Hot tub, being an ideal space for outdoor dining and entertaining during the fine weather. Matching steps then lead down to the remainder of the garden, being laid mainly to lawn with a further decking area to the rear of the garden. Shrub beds. Timber garden shed. Timber fence and wall boundaries. Outside water tap. Outside gas meter box. Outside lighting. Front pedestrian access to side of property via timber garden gate. From our prominent town centre office turn right down Rolle Street and take a left hand turning at the first roundabout, followed by a right hand turning at the next, heading away from town along Marine Way. Take the next left hand turning into Southern Road and proceed along past the turning for Carter Avenue before taking the next left hand turning into Belle Vue Road. The property will be found towards the top of the road, after bearing right, on the right hand side of the road.